SystemBinaryM1 - a professional indicator for trading short-term binary options, is a complete, self-contained author's strategy for working in the binary options market. The unique algorithm for analyzing the foreign exchange market is based on the calculation of reference points on three different time periods M15, M5. M1. Thus, the indicator simultaneously analyzes the long-term, medium-term and short-term price behavior before issuing a signal. The indicator is set in the usual way and works with any trade symbols. 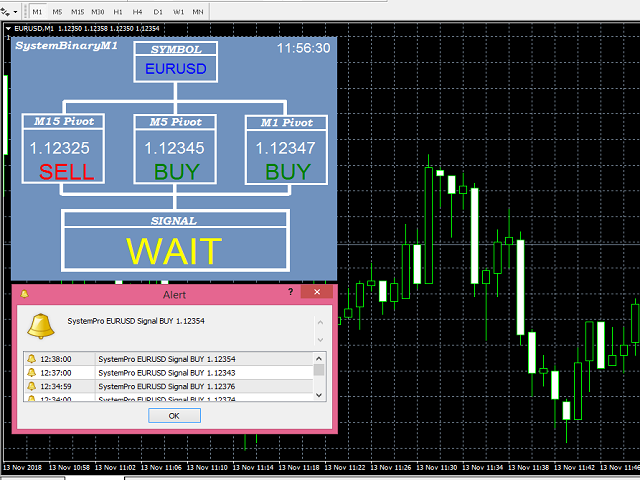 The indicator is fully configured for trading binary options with an expiration time of 30 - 60 seconds. It is a self-sufficient trading strategy and does not require additional indicators. notification = false - enable / disable sending notifications. mail = false - enables / disables sending email notifications. To set the indicator on a chart with any time period, the indicator will automatically change the period of the chart to the desired one. Wait until a trade signal appears (the signal is generated at the beginning of the emergence of a new candle M1). Open a trade in the direction of the trading signal, the expiration time of a binary option is 30–60 seconds. I recommend not to make a deal when changing trading sessions and the release of important economic news. This indicator can also be used for scalping.